One of the primary reasons clients don’t visit you as often as they should is because of cost. If you ask a majority of pet parents, they’d say that they say that they typically spend at least $100 for each visit. For people who have a large disposable income, that’s not much, but for the majority of the population, $100 needs to be budgeted into their monthly expenses. The trouble is, it’s hard to budget for unexpected expenses for pets. And if that pet parent hasn’t taken in their pet for a while, chances are additional services will need to be performed too. That’s why pet insurance is so important. Pet insurance can help with financial assistance in an emergency situation and provides relief where pet parents can focus on the health of their pet rather than the cost of a procedure. Veterinarians need to be more outspoken about the benefits of pet insurance. In many cases, it’s up to the pet parent to seek out insurance and decide. And there’s also a lot of confusion about pet insurance because it’s not the same as an HMO. The pet parent goes to their veterinarian, pays for the service at the time it’s due, and then submits a claim to be reimbursed. But the truth is, who has the time to research and understand this major buying decision? Why isn’t my practice educating me on the importance of it? If it’s your job to inform your clients of taking care of your pet’s health, why aren’t you speaking more about it? 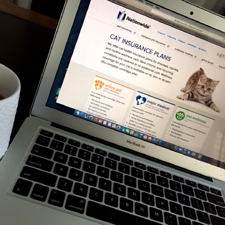 With that said, pet insurance is something you need to add into your conversations with your clients. If you do, there will be more visits because they don’t fear the cost they’ll be spending on their visit, their pet will be healthier and you could potentially save a life. So why wouldn’t you tell them about the importance of it? I’m not just talking about a flyer on the front desk. If a client brings in a new pet - please make it a routine to bring it up!. Talk about the benefits. Provide them examples of how it saves lives and cushions the expense of visits. It’s all part of the job to put your patient’s health first.